A few months ago, I attended a talk hosted by the local chapter of William Lane Craig’s apologist organization, Reasonable Faith. The discussion was centered on whether or not science has disproven God (admittedly no…but it doesn’t seem to point to one either) and was given by a local engineer and nice enough guy with an undergraduate degree in physics. I’m fairly informed of the stock arguments for and against God, particularly as they regard science, and was perhaps naively expecting to learn something. Instead, I was forced to squirm in my seat through an hour and a half of what could at best be called misrepresentations and at worst be called lies. The presenter took countless quotes from scientists (most of them confirmed atheists) out of context in support of his particular Christian theology, attributing connotations not present in the original formation. He also inserted helping after helping of meta-physics, which is not science, and shouldn’t in my opinion have been part of the discussion since it quickly delved into attacking atheistic arguments that had nothing to do with science – again, not what the promised discussion was supposed to have been focused on. I’m not sure why, but nobody in the audience asked the speaker why 93% of NAS members remained atheists despite all this purported evidence for God…one would have to assume that the best scientists in the world are simply too dim to see the theological implications of their own work, but that you, lucky you, are special enough to see them. I’m having trouble finding a link to the original physics slides online (you can download the biology version here), but I’ve posted the introductory slide below. You may note that of the three photos he chose to put up, only Dawkins has ever actually been a practicing scientist (and this was from the physics lecture, not biology). Daniel Dennett is a renowned philosopher, and Sam Harris has a neuroscience degree but is essentially an essayist. And really, a 75% youth exodus? Might that be helping to justify the lying? But my point is that the kind of dishonesty I witnessed should be troubling for any genuine Christian who is also committed to scientific and intellectual integrity. There are people out there who are so defensive about their faith that they are literally lying for it, and it reflects poorly on a large segment of believers. 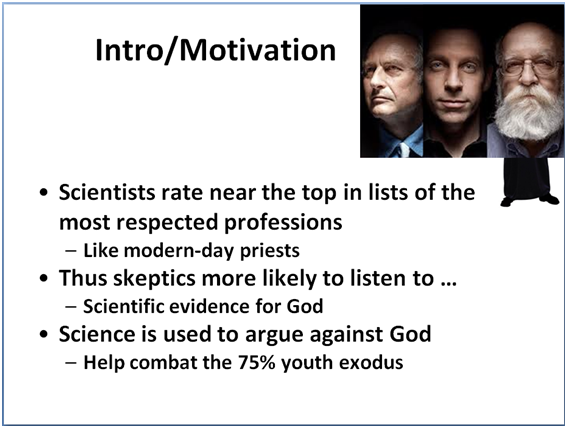 Anyway, knowing physicist Lawrence Krauss had just finished debating William Lane Craig in Australia, I thought I would share with him the dishonesty that WLC’s organization is committed to spreading, so I tracked down the PowerPoint I had downloaded from the meeting and sent it to him via email. He responded almost immediately, and I now have what I consider almost better than an autograph – a personal email from Larry Krauss. Thanks, WLC.